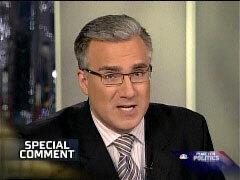 Should Olbermann Apologize for Accusing Bush of Pimping Petraeus? As NewsBusters readers are fully aware, MSNBC's David Shuster has apologized and been suspended for asking a guest on Thursday's "Tucker," "[D]oesn't it seem like Chelsea [Clinton's] sort of being pimped out in some weird sort of way?" David has been suspended and remains only for me to apologize without limit to President Clinton and to Ms. Clinton on behalf of MSNBC. We are literally, dreadfully sorry. Mr. Bush, you had no right to order General Petraeus to become your front man. And he obviously should have refused that order, and resigned rather than ruin his military career. The upshot is, and contrary it is to the MoveOn advertisement, he betrayed himself more than he did us. But there has been in his action a sort of reflective courage, some twisted vision of duty at a time much crisis. The man does not understand that serving officers cannot double as serving political ops is not so much his fault as it is your good exploitable fortune. Mr. Bush, you have hidden behind the general`s skirts, and today you have hidden behind the skirts of the planted last question at a news conference to indicate, once again, that your presidency has been about the tilted playing field, about no rules for your party, in terms of character assassination, and changing the fabric of our nation, and no right for your opponents or critics to as much as respond. With this in mind, I humbly ask the good folks at MSNBC: if it was so disgraceful of Shuster to pose this "pimped out" question to Bill Press, wasn't it just as disgraceful for Olbermann to claim that President Bush was pimping Gen. Petraeus? Should we who hold the office of the President with the utmost of esteem be expecting an apology from Olbermann, as well as his suspension?